Eee PC - 6 1/2" x 9"
In the last twenty years, I have purchased a lot of computers. I won't tell you how many, lest you question my frugality. Every one of these computers has been an Apple Macintosh -- until now! I was hoping that Apple would complete their line of laptops with an inexpensive subcompact laptop. Instead, they put their energy into yet another high priced sleekingly thin MacBook Air. Meanwhile, several other companies have been producing small entry level laptops. 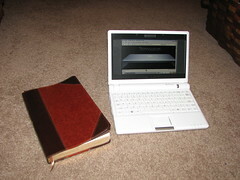 I am lured to a small inexpensive laptop because of its extreme portability and its potential use in the classroom. I was tempted by OLPC 'One Laptop Per Child' but its operating system didn't seem to be too versatile. After a little research, I decided on the Eee PC. It is made by ASUS, and runs a version of the Linux operating system. (Free open source) It is a full functioning computer complete with wireless internet, the ability to view movies and videos, email, skype, etc. All this in a 2 lb. package the size of a medium size book and the price of an iPod Touch. The computer comes with some basic education and office software. I have already been using it in the classroom. Now I just have to find someone who wants to donate a dozen to our classroom! I really think Apple missed the mark in not joining the market. where did you buy it? I have been looking at them since reading about yours. Do they have a DVD player slot?